Meats: Oil and fat from animals (even organ meat) can be quite healthy for many people. There is a clear difference between animal meat from large industrialized production farms and wild meat. Meat, milk, or cheese from cows that have been fed corn, kept indoors (away from the sun), and stressed to the point of needing antibiotics and hormones – has disease causing pro-inflammatory properties. Meat, milk, eggs, and cheese from animals that are pasture-raised on their normal diet (or simply wild) usually have much higher amounts of beneficial CLA, Vitamin D, Omega-3, and hundreds of other necessary vitamins and minerals. Cooking: Cooking destroys the health properties of some fats and oils. The higher the temperature and the longer the cook cycle, the more likely fat and oil will become oxidized and cause more harm than good. 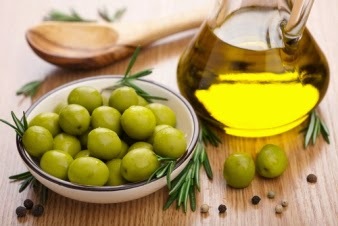 Frying something with olive oil destroys the health benefits of olive oil. Organic butter, ghee, or coconut oil are more likely to survive the heat of cooking. Raw food is clearly better than fried food. Plant oils (olive oil, walnut oil, sesame oil, etc) should usually be consumed UNPROCESSED and UNCOOKED for maximal health benefits. Fat Based Vitamins: We know that natural Vitamin D, Vitamin A, Vitamin E, and Omega-3’s are necessary for good health. Did you know that Vitamin D is naturally present in fresh cow’s milk, but processing removes it (usually synthetic Vitamin D is then added back to milk for advertising purposes). Did you ever wonder why free-range eggs are so much more orange? It's the vitamins. Natural sources are best. Many of these oil-based vitamins in our multivitamins are synthetic and cause more harm than good. Cod Liver Oil (tested for purity and contaminants) or Fish or Calamari Oil are also a great source of some of these vitamins. Other Good Oils: Eggs (organic, naturally fed, free-range chickens), nuts and seeds (walnuts, almonds, macadamia nuts, sesame seeds, hemp seeds, chia, flax, pumpkin, sunflower seeds), dark chocolate, and avocados are a great source of oils, fats, and fat-based vitamins. Peanuts are a legume not a “nut”. Fat-free / Low-fat milk: This is another form of processing food. Again, processed food is not good. Pasteurization destroys natural enzymes and vitamins. Homogenization causes fragmentation of the natural fat micelles which causes fat to be absorbed directly into the blood without proper digestion. The only good milk is milk straight from the animal. If you can’t get that, stay away from milk.